Ask Melani Hom to recount how April 15, 2013 unfolded through her eyes and she still gets emotional a year later. The date – if it hasn’t been engrained in runners’ memories – was last year’s Boston Marathon, where scenes of rescue workers attending to bloody finish line bystanders overtook those of happy, finisher medal-wearing runners. The Northwest D.C. resident had just crossed the finish line in a personal record time of 3 hours, 5 minutes, but the coach in her wanted to stick around and cheer for other runners as they came in. She credits what she calls a “selfish moment” of leaving the finish area to go shower and recover at her cousin’s apartment in Boston where she was staying as saving her life. Her voice cracks and tears well up in her eyes when thinks about the chaos that ensued trying to find her friend, fellow Boston racer Lauren Gabler, and the loss of life and limbs that day. Hom and Gabler – who remembers well watching the news coverage in the Italian restaurant in the first floor of a hotel a mile from the finish line – wanted to give back to the race, the sport, the community that had given so much to them. “We both felt like we needed to do something more because we were so lucky that day,” said Gabler, 30, of Arlington, who heard and felt the blasts a block away from the Boylston Street finish. Gabler and Hom met during a Ragnar Relay race in D.C. some time ago and their friendship grew out of the shared passion for running. Together they crafted the idea of creating and selling commemorative Boston running jerseys – singlets that could be worn during races or runs. These do-gooders knew the jerseys could be sold to their runner friends to commemorate the race with the proceeds going to One Fund Boston, a charity to collect donors for those affected by the Boston Marathon bombings. Hom was talking to a contact she had through her local triathlon training company — Laava Performance — who designs and makes flashy triathlon gear shortly after the race. When Hom mentioned she ran the Boston Marathon, the woman on the other end of the phone, Boston native Kristin Mayer, instantly offered her design services. From there, the idea started to come to reality. The proposed jersey bore inspiration words like “strength”, “honor”, “heroes”, and “bravery” mixed with familiar Boston towns and landmarks like “Hopkinton”, “Wellesley”, “Heartbreak Hill”, and “Boylston Street”. It would also have the date of the 2013 race – April 15 – and were blue and yellow in Boston style, of course. Having the designer confirmed, Hom reached out to get the apparel. Everyone she talked to in the initial steps – even though coming from the cycling or triathlon world – wanted to help the runners’ cause. The two started an Indiegogo campaign, a crowdfunding site, to help raise money and get their efforts off the ground. The site would carry a brief summary of their project with people able to buy a jersey through their webpage. If enough orders were gathered, they could be purchased for everyone. They needed to raise at least $4,000 to bring the jerseys to life. Gabler, a communications consultant with a constantly bubbly and energetic personality, would drum up support in the running community. 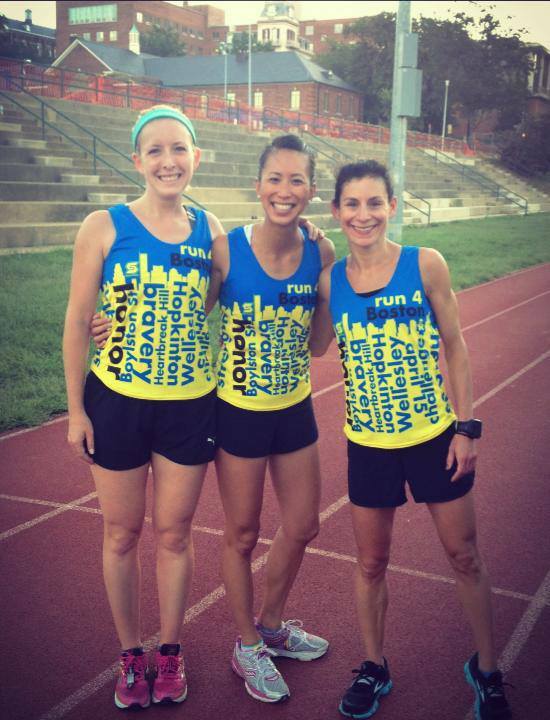 She reached out to her running friends through different running groups weekend long runs and weekday track workouts. Melani dug into her triathlon network. Gabler established a Facebook page to generate interest for the effort – “Run4Boston” – which has more than 200 followers today. Gabler had friends from high school – people she hadn’t spoken to in years but were runners – buy a jersey. Hom’s sister in California made a promotional video for the campaign. By early June, less than a month after they started, the project had 92 supporters and more than $4,300. The project sold roughly 100 jerseys to date and donated more than $3,000 to One Fund. “We didn’t know if only our parents would buy them or random people would buy them,” Gabler said. In the end, it was a good bit of both. Those from across the country who bought their jerseys have sent pictures of them wearing their new garbs in races. The jerseys have been spotted in several local races including the Army 10 Miler. Gabler wore hers during the Marine Corps Marathon last October. Their promotional Facebook page carries pictures of runners as recent as March’s Rock ‘n’ Roll USA Half Marathon wearing their blue-and-yellow shirts during races. Because of the nature of Indiegogo, only those who ordered a jersey during the campaign received a jersey. Hom and Gabler would have to repeat the process – which takes a great deal of money to get off the ground. The two women are returning to run the Boston Marathon again next week. This time they’ll wear the jerseys they helped create.